Astrid Schoerke - Welcome Marc Gruber! This new season is beginning with a new face: We want to express our dearest welcome to the brilliant hornist Marc Gruber! With his 25 year, Marc Gruber already has an impressive resume, containing various prices, awards and solo performances. 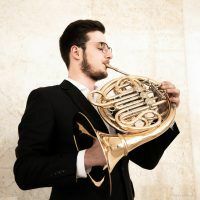 In 2016, he won the 2nd price (no first prize was awarded) at the Internationale Musikwettbewerb der ARD, he is an awardee of the Lions European Music Competition and this year celebrated his debut at the Debüt im Deutschlandfunk Kultur with the Deutsche Symphonieorchester Berlin and Antonio Mendez performing Glières Concerto for Horn. In the upcoming weeks he can be witnessed live at two distinguished series: On September 2nd he will play with the German-Israeli Else Ensemble at the festival summerwinds münsterland, performing a program of rarely heard pieces by Brahms and Mozart, as well as Adolphe Blanc’s septet in E major. On September 9th Marc Gruber and his piano partner Zeynep Artun-Kirchner will sweeten Berlin’s lunch break with an Espresso Concert at the Berliner Konzerthaus. We are looking forward to accompanying this fantastic artist on his musical journey!